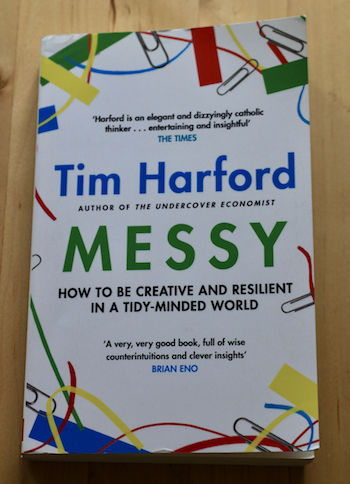 I received Messy by Tim Harford for Christmas, having requested it after being drawn in by its strapline - ‘How to be creative and resilient in a tidy-minded world’. While this is not a book about UX I think it is still a useful book for a UX professional to read. It is basically a book about how it is OK to be a bit messy and how it can actually help us to be more creative. It is full of examples of how mess can help us, from making better music to creating a small elite group of soldiers who would become the SAS. It looks at how allowing people to personalise their work space, be it a cubicle or desk, can help them to do better work. It looks at how the use of disruptive instructions helped create music we now regard as classics, although at the time it probably did not feel like a pleasant experience. And best of all it shows that having a pile of papers on your desk rather than filing them straight away can actually mean smaller, more useful archives! I love this fact because my desk, wherever I have worked, has always had a pile of papers on it, in which I have always been able to find the exact thing I am looking for at any given time, but which has upset many people because it looks untidy. As stated in the book the useful papers will come to the top as you keep going back to them, while the dross settles at the bottom and can be thrown out (or recycled) every so often with no fear of losing something you might need later. But aside from this it made some really good points about why tidy is not always better and how mess, or being interested in many different subject areas, can help us to put together ideas that might not have collided otherwise. It is about embracing mess, whether that is physical or metaphorical, and the unknown and not worrying that we do not know what will happen next. We do not have to control everything but be ready to adapt and improvise as events proceed. In a world that is changing far quicker than ever before, these are skills I think we all need to learn if we are not to be driven crazy by the speed of change around us. If that means a little bit of mess I am all for that. Note: I have to remind myself that this is not an excuse to hoard. There is keeping a pile of papers on your desk and every so often chucking some out and filing the others and there is keeping EVERYTHING FOREVER. That is a different problem altogether.